Notre-Dame (or Sainte Marie) des Echelles - we wrote about it here. The building still exists, as you climb the hill to go out of town to Loches, but is now a privately owned holiday home. It was deconsecrated at the time of the Revolution. 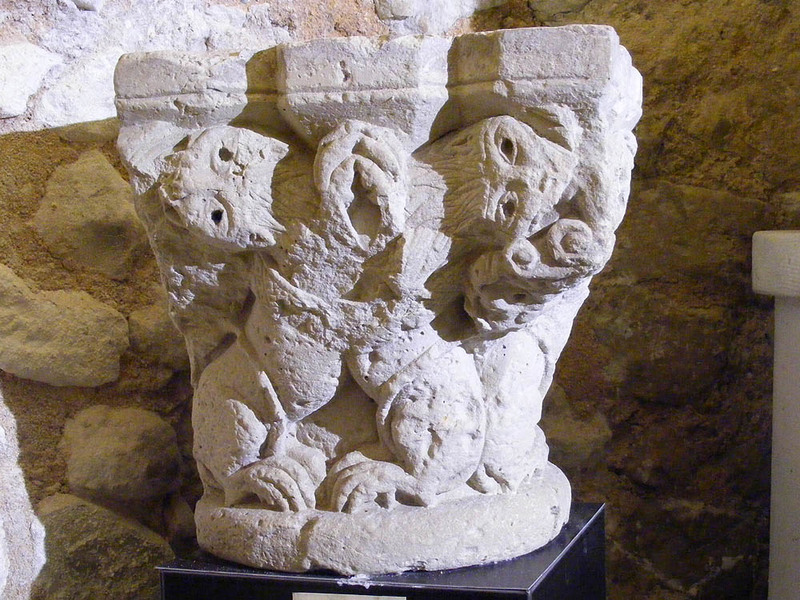 Medieval carved capital from the former church of Saint-Nicolas. Saint Mélaine - we wrote about it here. Once an important pilgrimage destination, the building is now a semi-ruin, in the grounds of the privately owned chateau. It has recently been rather controversially re-roofed (permission was granted to use a non-traditional material) and there is talk of the chapel being reconsecrated. Saint Nicolas - we wrote about it here. Famous for its wonderfully fanciful carved chimeras and beasts, it was used as a stable during the Revolution and deconsecrated. It became a cart makers, and is now a private home. Saint Pierre - we wrote about it here. It is the only remaining consecrated church, usually referred to as l'abbaye (the abbey). Centrally located, its over scale Burgundian style spire is the most recognisable edifice in town. Sainte Marie-Madeleine - this is the only church that seems to have entirely disappeared. It was in the bourg neuf (new town) just across the river at the end of the old bridge. Its name and position reveal its association with the prostitutes of the town. 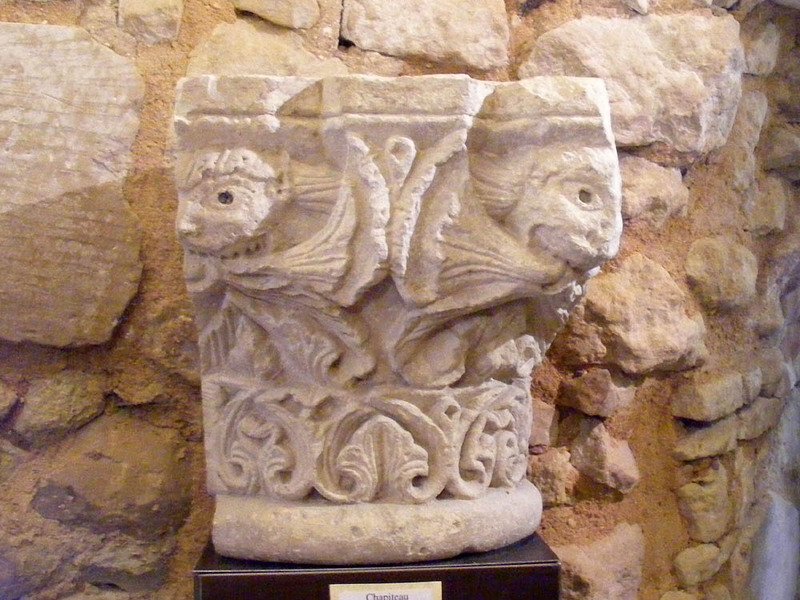 Another capital from Saint-Nicolas in the museum. As well as the parish churches there was the Chapel of Ease (la Chapelle de Tous-les-saints) in the medieval cemetery (now the arboretum). This building still exists, but only just! It is clearly in a parlous state, and was lucky to survive a demolition attempt in the mid 20th century. It contains important wallpaintings, but the building is too dangerous to allow visitors. The Special Operations Bureau was in action again last weekend, this time travelling to the Charente. Once again, along the way we found (purely by coincidence) a weird thing, but whereas the last one was an array, this weired thing was a river. 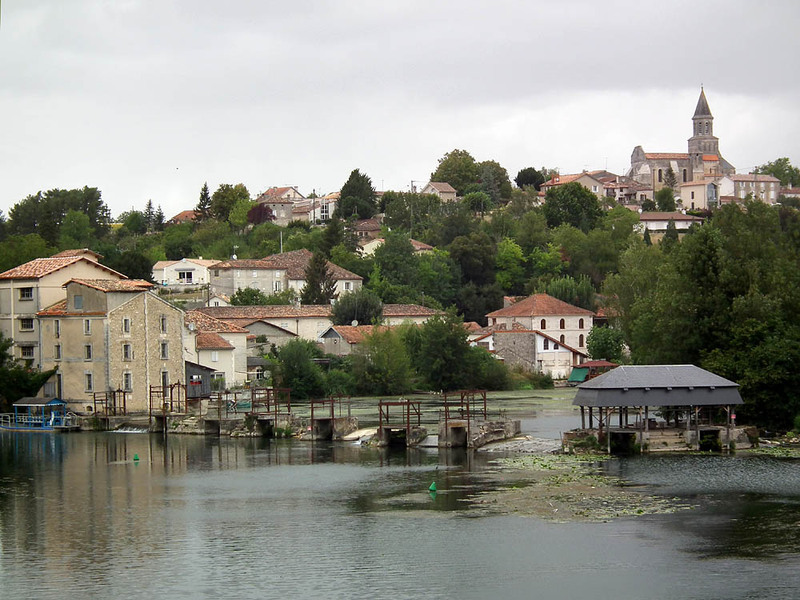 The Charente river is navigable all the way from the coast (near Rochefort) to Angouleme, a distance of 167km. Along the navigation there are 21 locks (ecluses), associated with weirs, water mills, and gravelly banks across the river. In various places the navigation leaves the river for a canalised channel before rejoining further past the obstruction. The barrage itself is pretty normal - a line of rocks cemented in place across the river, damming the river to provide a decent fall of water to power the mill, but along it are a series of structures which look like mini locks. These are eel traps, and although we didn't stop to ask I assume they work for elvers swimming upstream to grow into adults, and the adults returning downstream to breed (which they do in the Sargasso Sea). The locks are interesting compared to the UK equivalent. Whereas in the UK you need a lock key (or more properly a windlass) to operate the hidden mechanism of a lock, the lock mechanism here is a big wheel which you turn. 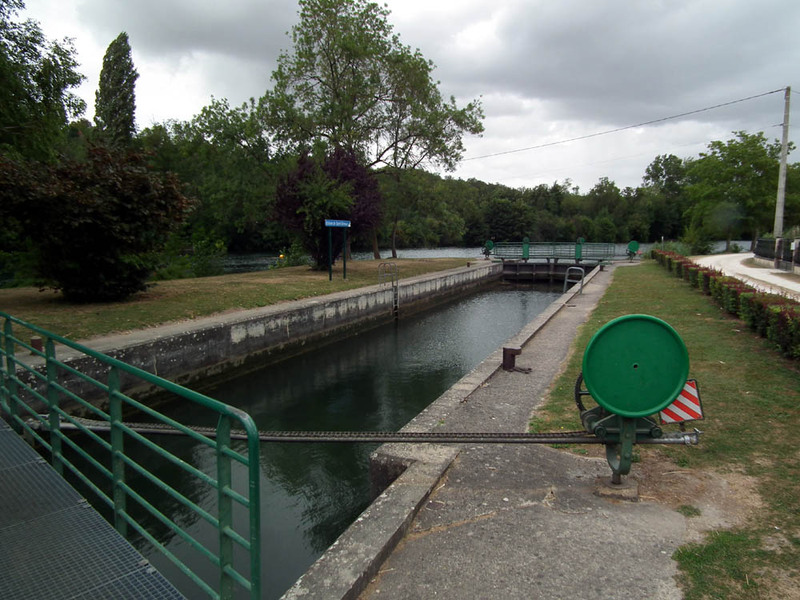 The method of opening the lock gates differs here too - most locks in the UK are opened by pushing the gates open, whereas here you use another wheel and a chain driven mechanism to wind the gates open. A couple of weeks ago I was sitting in the salon reading in the late afternoon when I heard the unmistakable sound of a horse clip-clopping down the street. It's not the first time we've had a horse come down the street, but it is unusual, so I rushed to the door to see who it was. It was particularly intriguing because not only was there the sound of the horse's hooves on the road surface, but whoever was accompanying the horse was playing a flute! 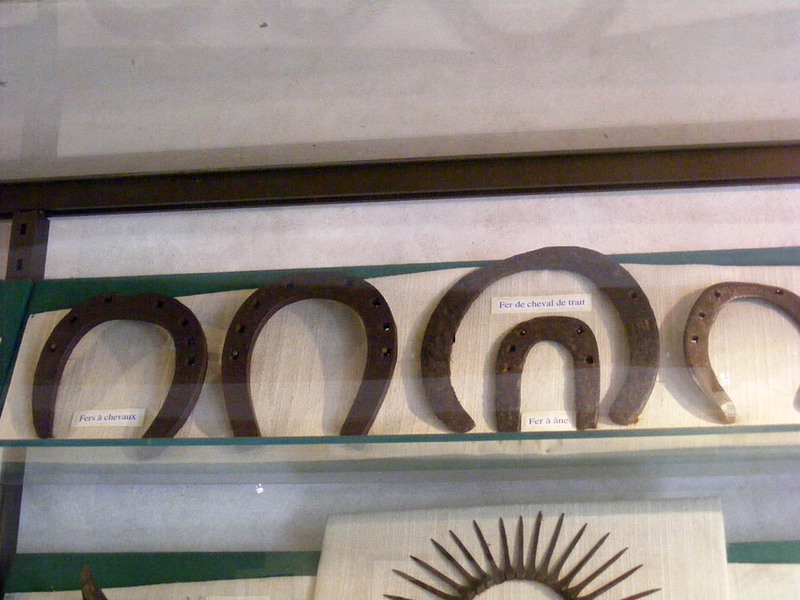 Horseshoes on display at the Poterne, Preuilly's museum. The big one is for a draft horse, the little one underneath for a donkey. I got to the door just in time to see a simple covered wagon disappearing. The rig stopped outside our neighbour's house and the flute playing stopped while a man spoke to the horse, then they moved off, and he took up the flute again. Frankly it was all a bit spooky. Simon was out in Célestine doing a picnic for Chateau Valcreuse. He tells me that he saw the outfit earlier, near Yzeures, and gave the guy a wave as he passed (slowly and carefully, as one should when there are horses involved). 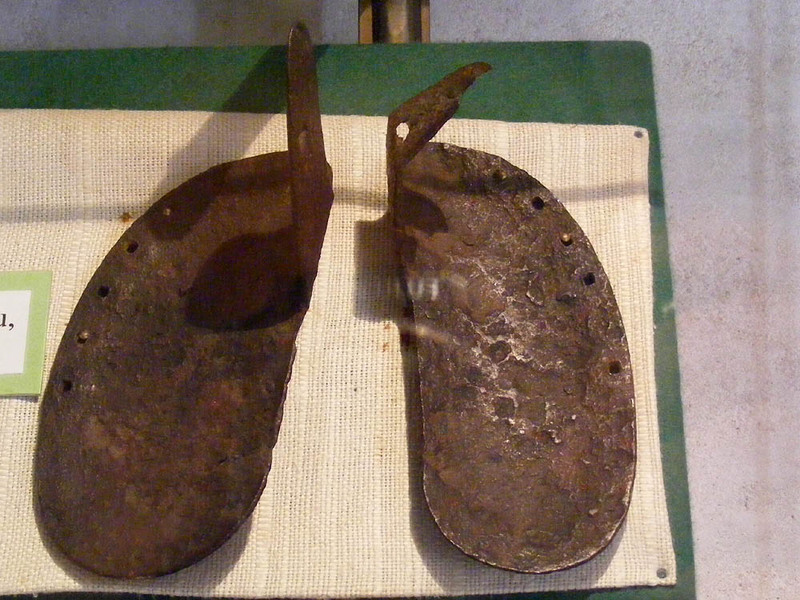 Oxshoes in the same display. Since I was too slow and too intimidated to get photos, you will have to make do with museum artefacts from the Poterne. Well, a rash might be an exaggeration. We've had two in the house in the past month. I think the hot weather had something to do with it. Either they were flying in through the windows or they were emerging from some firewood under the stairs. 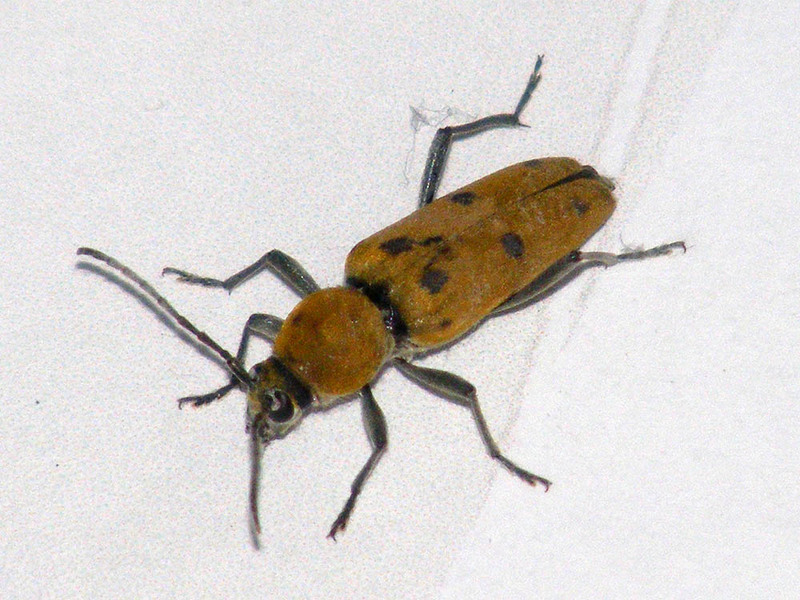 The Spotted Longicorn Chlorophorus glabromaculatus is actually a black beetle, but like many longicorns, it is covered in short dense hairs. In the case of this species the hairs are golden over most of the wing cases and thorax. It makes them very difficult to photograph well. The camera doesn't know what to focus on because they are downy and the flash reflects too harshly. 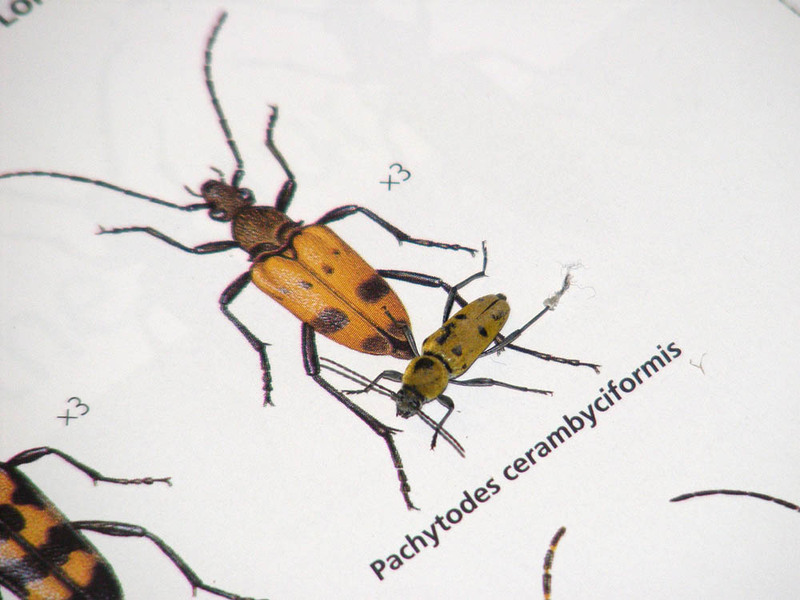 The IUCN Red List of Threatened Species* shows its population is considered to be stable and it is common in France and Italy, rated as LC (least concern) due to its wide distribution (from Belgium in the north to Spain and north Africa in the south and across to Greece in the east). Its lifecycle requires dead wood in living broadleaf trees (especially oaks but also chestnuts and willows) just like many other longicorns. In French they are called le clyte poilu. The adults are active in July and August. *Nieto, A., Dodelin, B., Campanaro, A. & Méndez, M. 2010. 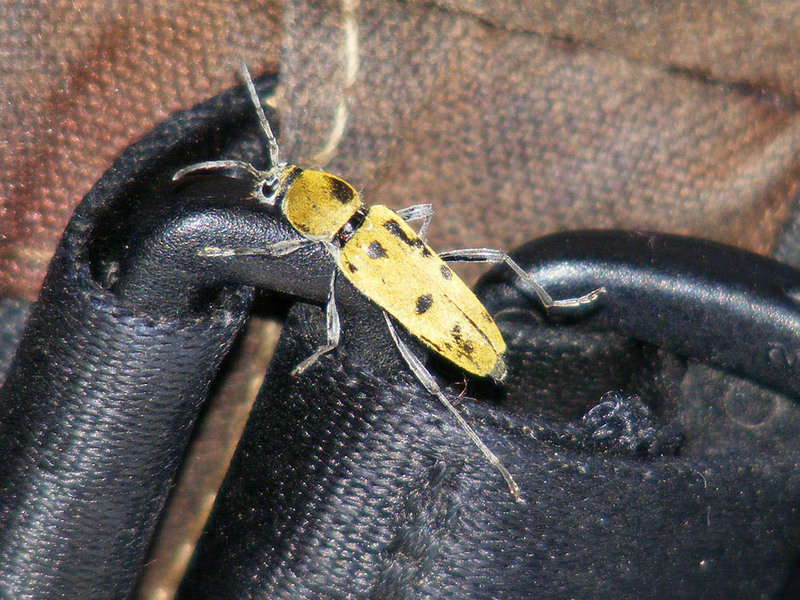 Chlorophorus glabromaculatus. In: IUCN 2012. IUCN Red List of Threatened Species. Version 2012.1. <www.iucnredlist.org>. Downloaded on 26 August 2012. When you look up 'croix de Phylloxera' on the internet what you get are a load of entries about Christian crosses erected during the time of the Phylloxera crisis in the late 19th century. Phylloxera is a North American root aphid that attacks the vines. It was accidentally introduced on American vine stock and almost wiped out the French wine industry its effects were so widespread. A large cash prize was offered to anyone who could eradicate the pest, but it has never been claimed. In the end, after much trial and error, a resistant American vine which tolerated French soil was identified and French varieties of vine grafted onto this new rootstock. 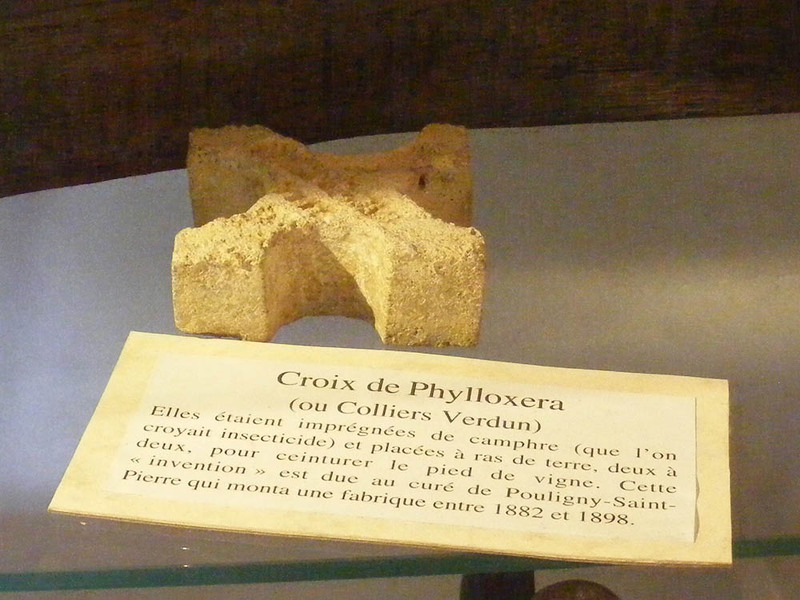 Croix de Phylloxera (or Verdun Necklace). They were impregnated with camphor (which was believed to be an insecticide) and placed at ground level in pairs to encircle the base of the vine. 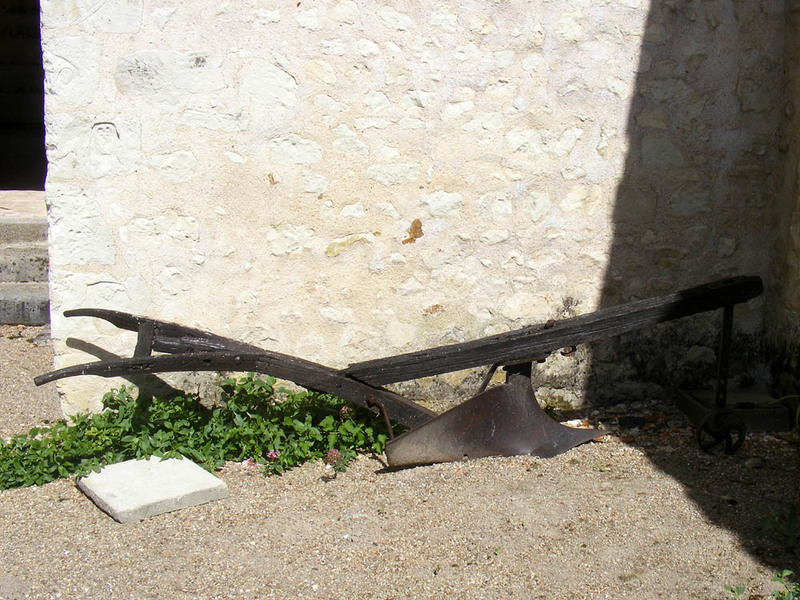 They were 'invented' by the priest at Pouligny-Saint-Pierre, who ran a factory manufacturing them from 1882 - 1898. All museums have their share of these quirky and obscure little objects. The only way of keeping their history alive is to make sure the stories are recorded while they are still within living memory. Small locally focused museums can be just as good at doing this as the great national institutions, but they are totally reliant on the community for their success. It's a credit to the local archaeological society that Preuilly's museum has some real treasures and genuinely sheds light on past times. Look!! Up in the sky!! 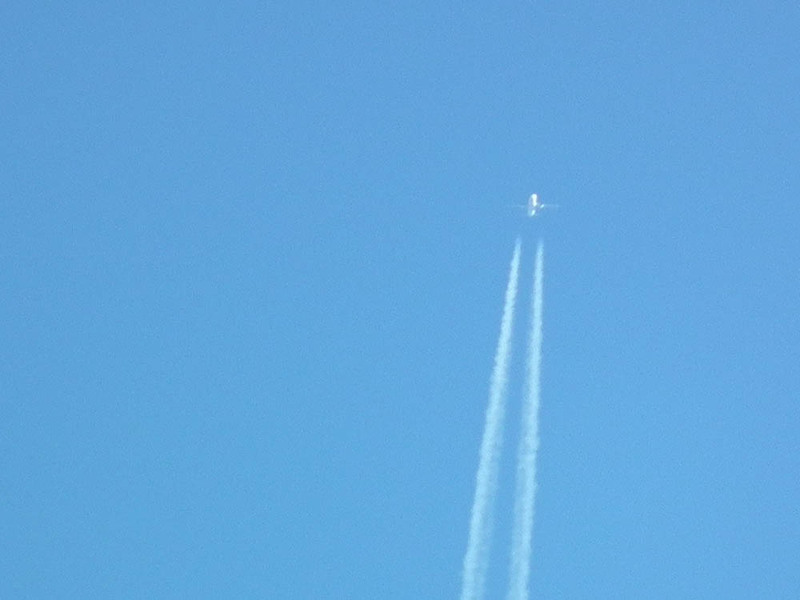 Have you ever looked up and wondered where that plane is going? Wonder no more. 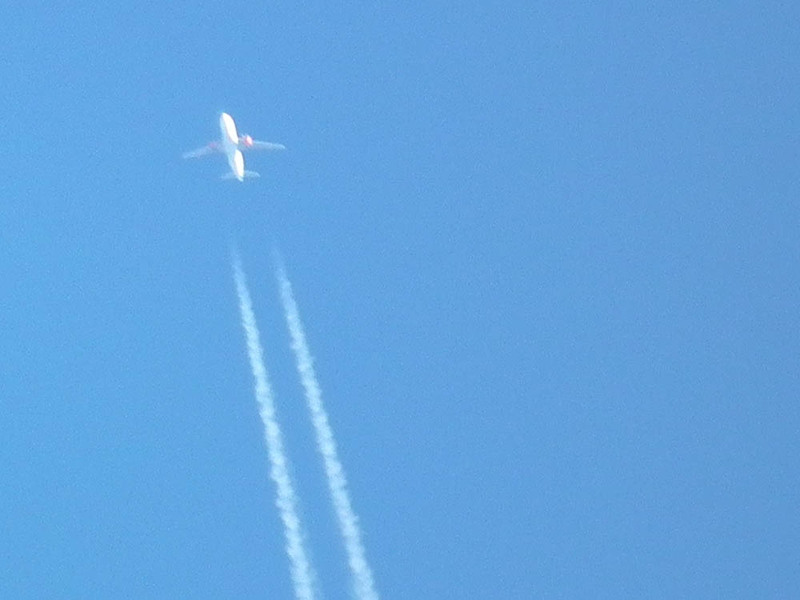 For ages I have maintained that most of the planes that fly over our head are to or from London (most of the locals says it's Paris), but now we have proof. 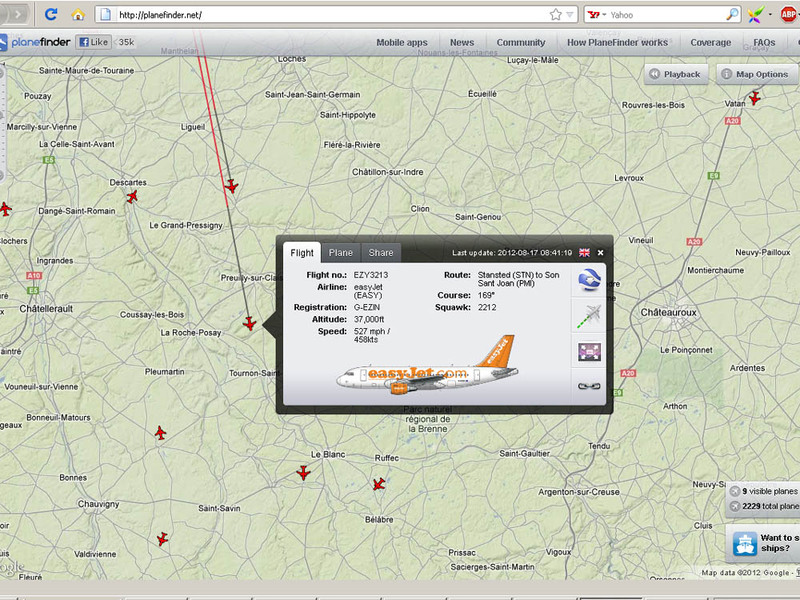 What has made the difference is Planefinder, which is ace. 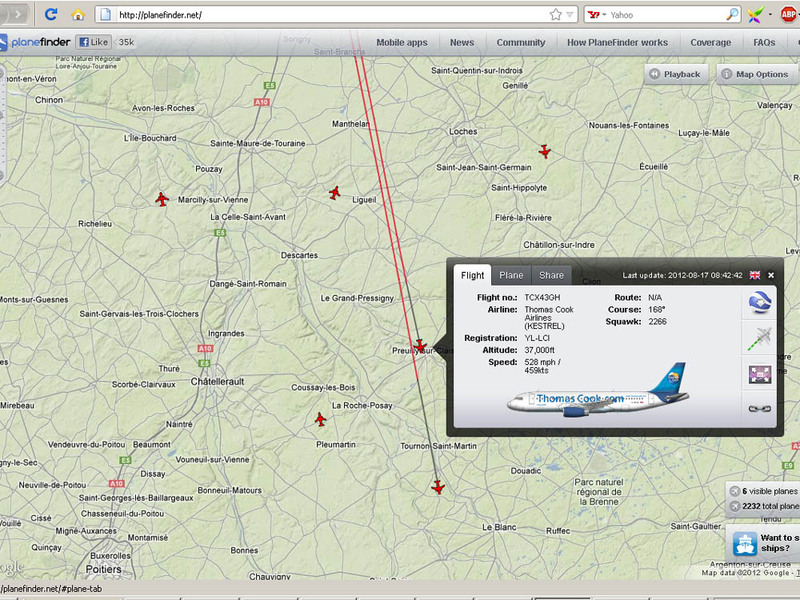 All from looking at this map of Planes over Preuilly. 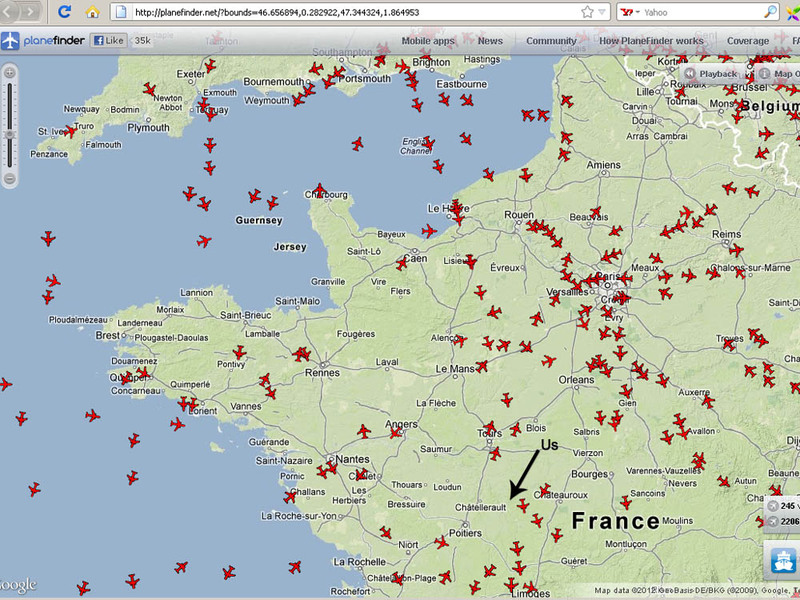 For a broader view of planes over France use this map. You don't have much more time to visit the very good little museum in Preuilly before it closes for the season. 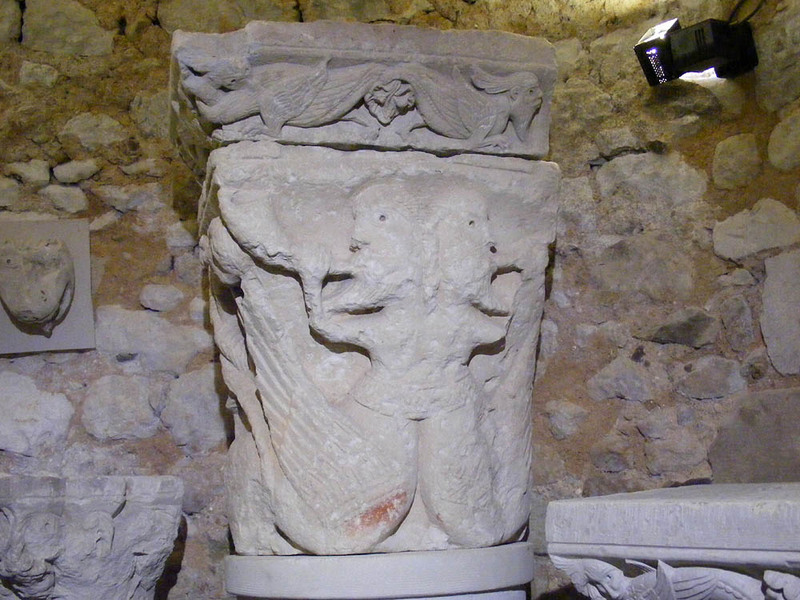 It is located in the Poterne, below the chateau, run by the archaeological society and manned by volunteers, all of whom are kids on school holidays. That's why it is only open during the long summer school break, and school goes back on 5 September. 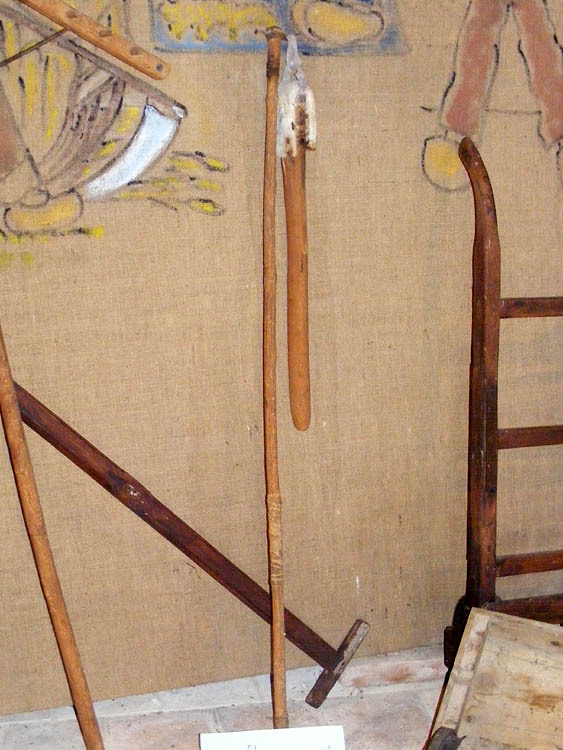 Below is a selection of farm tools on display, but the museum covers all manner of things, in the way local museums do. We featured it here on the blog before. 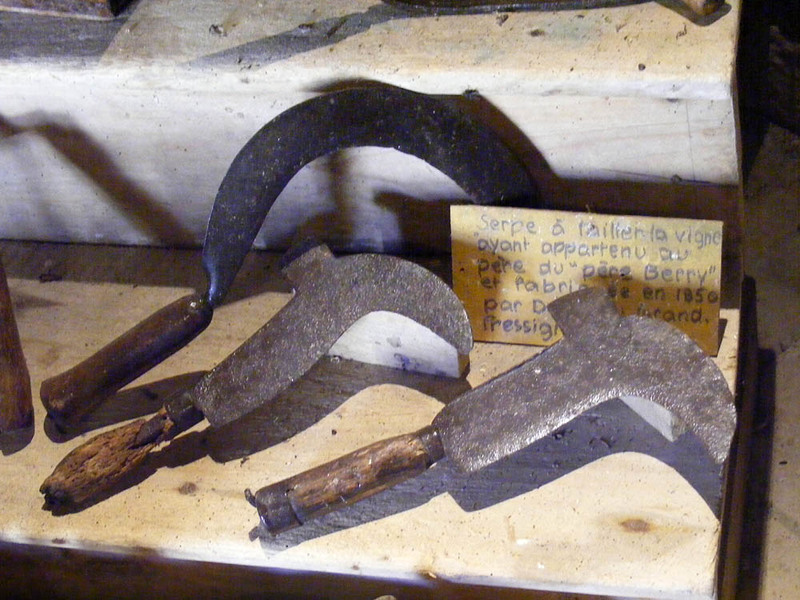 there was a specialist tool for chopping beetroots? 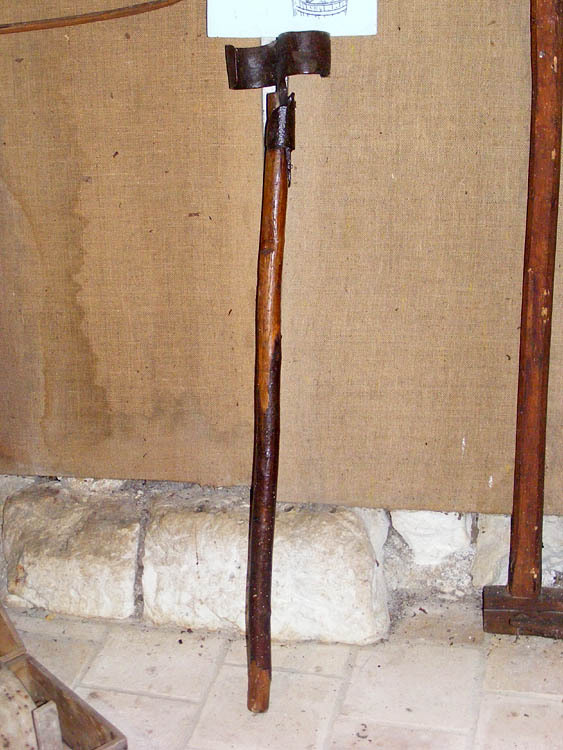 A flail, used for beating the wheat grains from their ears. and made in 1850 by D... in le Grand Pressigny. A few weeks ago we posted about arret minutes signs that indicated that you could park somewhere for a few minutes if you were just nipping in to the bakers. Recently I snapped this no parking sign whilst sitting at traffic lights in Issoudun. Curiously, it is a no parking sign positioned in the middle of a bank of what are clearly marked parking bays. 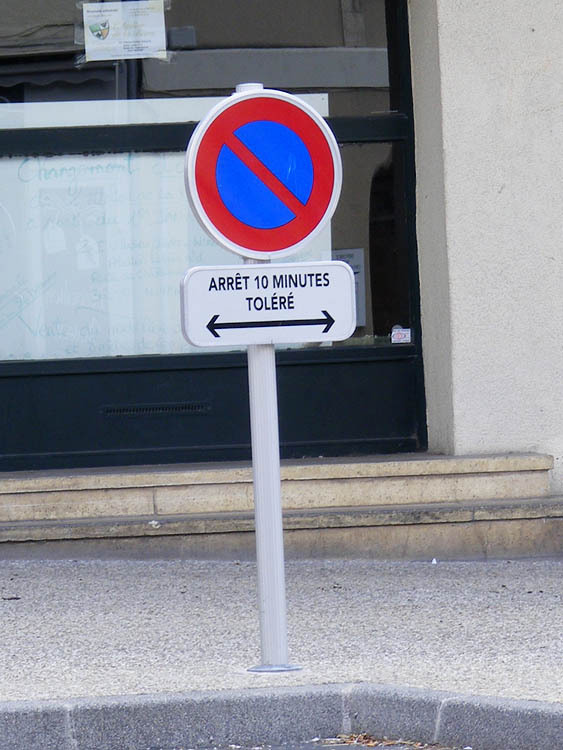 The wording underneath explains all - 10 minutes toléré - 10 minutes tolerated. There are three openly acknowledged levels of the law in France - legal, illegal and tolerated. This middle ground of tolerated behaviour exists of course in all pragmatic societies, but putting it in writing would be considered really rather odd anywhere but France. Although I didn't notice one, I'd be willing to bet that these parking bays service a boulangerie or a pharmacie. In Preuilly, it is clearly acceptable to park outside these institutions, no matter how much you impede traffic or force pedestrians onto the road, so long as you are simply popping in to pick up your sackful of medications or your daily pain. There is a very nice explanation of the concept of toléré in French-American lawyer Jean Taquet's English language newsletter of July 2009. Hey! Push a bit less! On a recent visit to Cheverny with clients we discovered we were in for a treat. 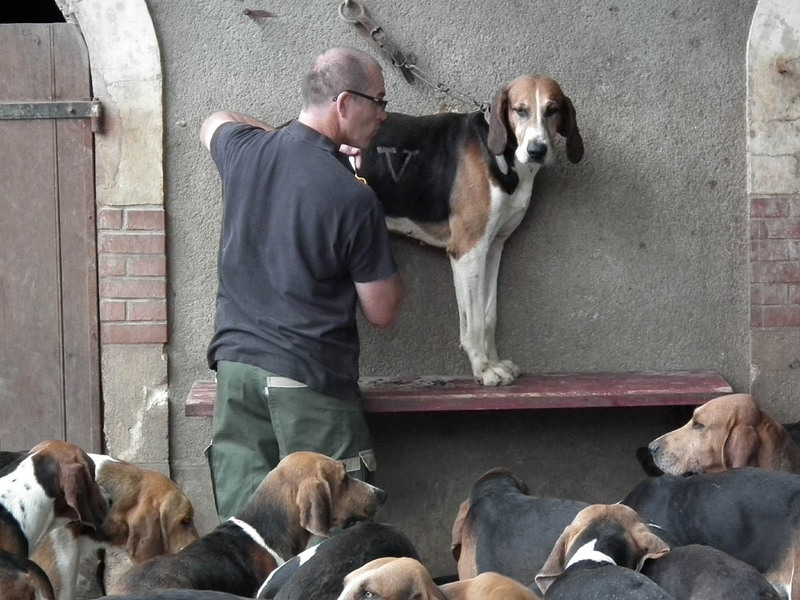 The kennelman was in with the hounds and preparing to clip them. 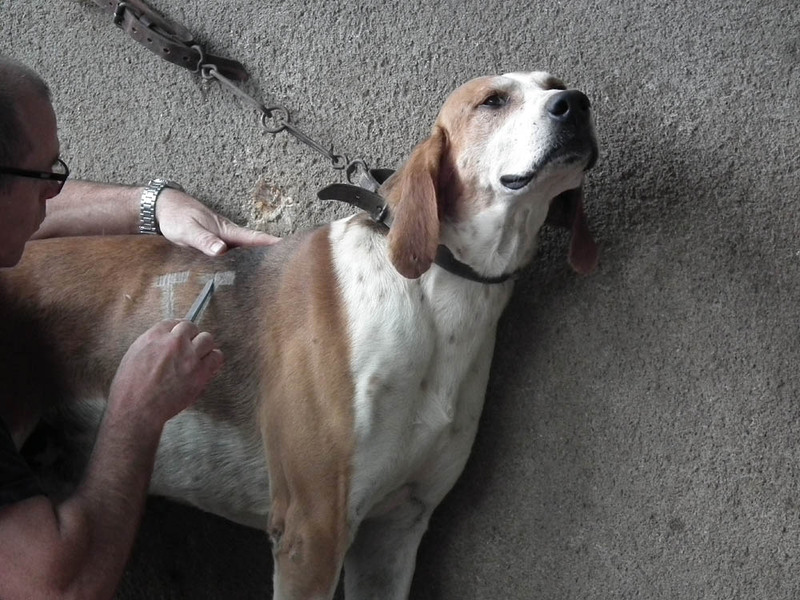 Whenever the hounds go out working they have a V clipped into the hair on their flanks. This is to identify them as belonging to the Cheverny pack (V stands for Vibraye, the family at Cheverny's title - they are the Marquis de Vibraye). 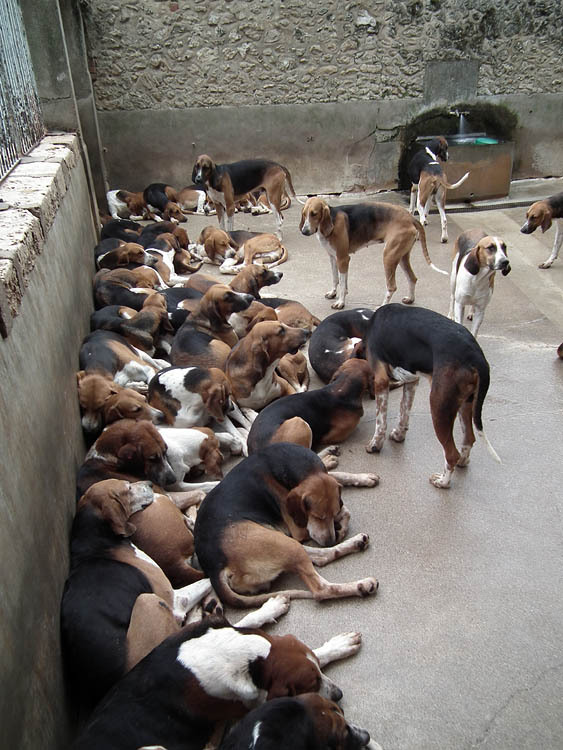 If a hound is somehow separated from the pack in the field, anyone who finds it will know who to contact so the dog can be restored to its owners. We were fascinated to discover that the V is created by neatly snipping the hair with scissors. I'm not surprised to find they don't use an electric buzz cut razor, as I imagine the potential for sending the dogs wild is fairly high. I had assumed the V was formed by using a stencil and manual clippers or razor though. In fact it is done freehand, although that hand is clearly so experienced it could do it on autopilot by the look of it. After the initial excitement of greeting the kennelman, the dogs split into two groups. One group, obviously the cooler more laid back types, arranged themselves in comfortable piles along the front wall of the yard and relaxed. Others, presumably the teacher's pet types, trying to ingratiate themselves and draw attention to themselves (sir! sir! pick me! pick me!...) swarmed about behind him, pushing and shoving. It wouldn't have done any good, as he had a list, which he pinned to the door, crossing off each dog as he finished with it and looking around for the next one, calling it up by name. The dogs all have names, and the kennelman recognises each of them and knows their name, every dog born in the same year having a name starting with the same letter. Whenever he is in the kennel yard they jostle for position to get close to him and if there is any socially unacceptable behaviour from them, a word from him stops it instantly. Several times he had to tell the dogs standing behind him not to push so much. When he lifted a dog onto the bench he quickly checked its condition, running his hands over it and lifting the skin along the spine and looking into its ears, speaking to the dog indiviually all the while. Once clipping commenced the dog stood there, blissed out. Occasionally it would turn its head, which was firmly put back into the forward position. The clipping is obviously deliciously tickly and the dogs love it. At this time of year it is always good to have recipes for using up quantities of over ripe tomatoes. 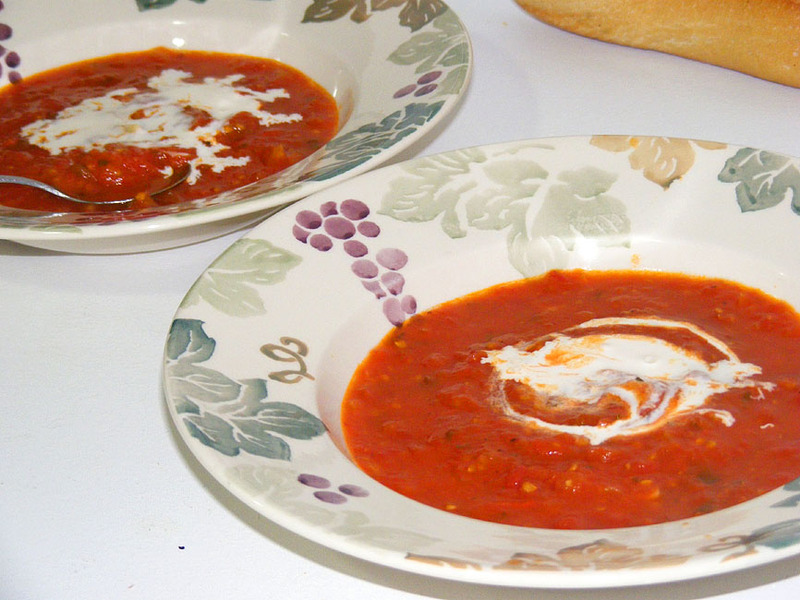 Tomato soup is a favourite with everyone and I find this recipe as easy and tasty as any. These quantities serve 4. Sweat the onion and garlic in the oil then add the rest of the ingredients. Cover and simmer gently for 15 minutes. Uncover and simmer until reduced to a suitable consistency. At this stage you can run it through a food mill if you want a smoother soup with no seeds. Serve with a swirl of cream. Any leftovers can be reduced a bit more and used as a sauce for pasta or fried snacks. 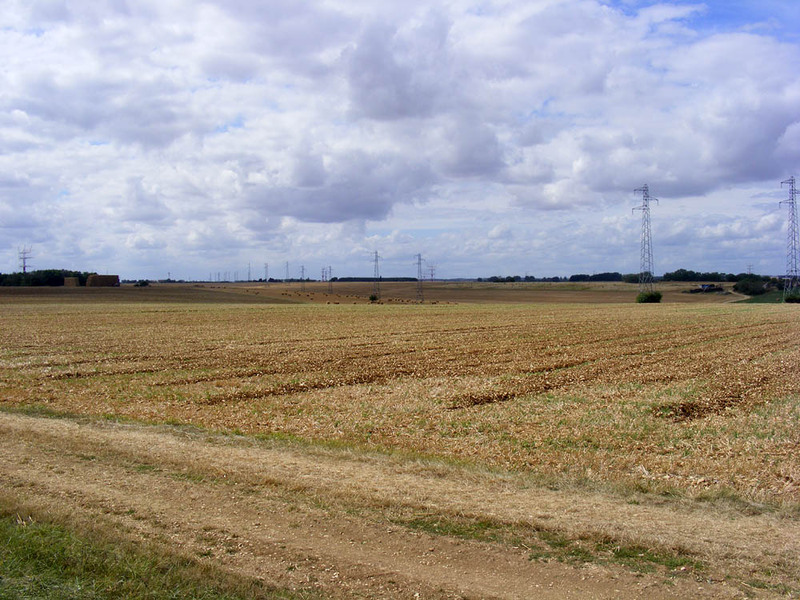 All these photos were taken on the road between Chateauroux and Issoudun, east of us, beyond the Brenne, in mid-August. 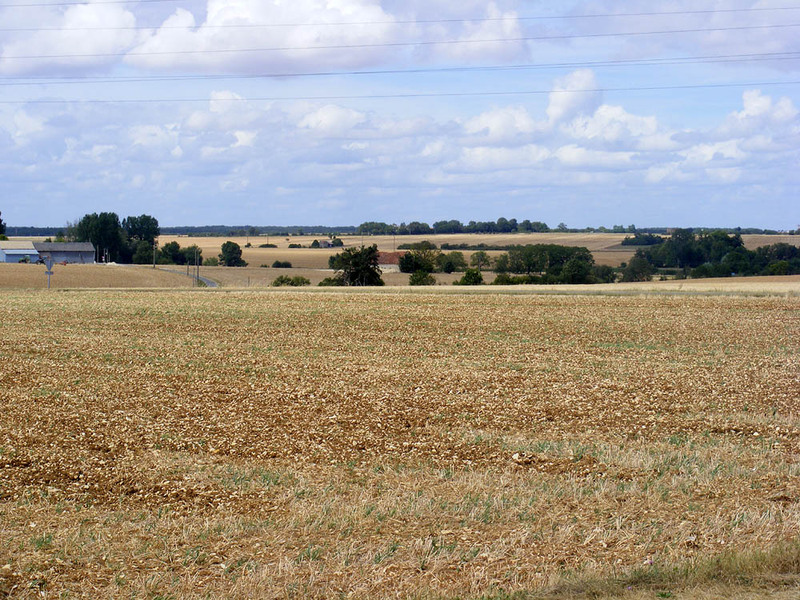 The harvest is just in, serving to emphasis the open, featureless nature of the countryside. It is, I think, a difficult landscape to love. There is no shelter, no place to hide. It is hot in the summer and cold in the winter, with nothing to stop the wind, and very little shade. 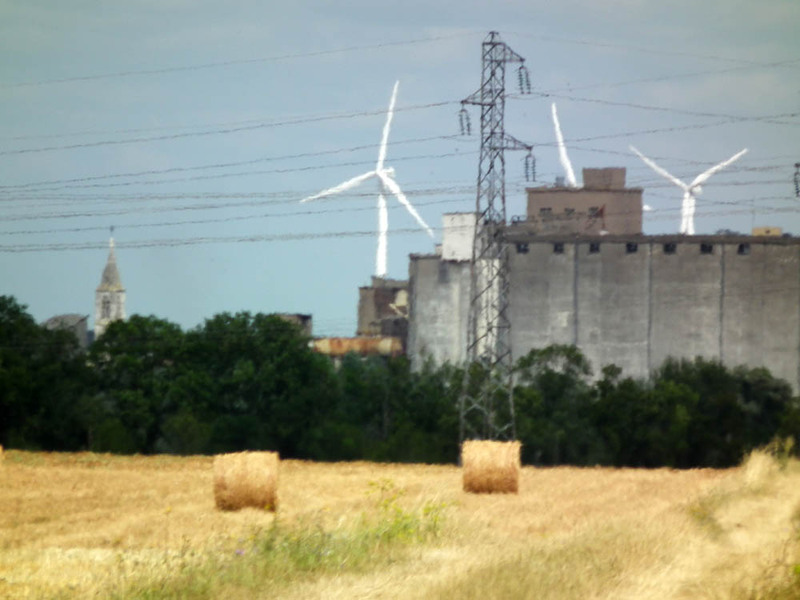 These are big grain farms, and have clearly been like this for decades, maybe centuries. Even the old stone farmyards are composed of massive unadorned buildings pragmatically arranged in rectangles, as if the occupants are making a stockade against the landscape and perhaps hoping for a more human scale safe haven in the centre. Long driveways planted with avenues of trees form one of the few concessions to aesthetics. In the distance and distorted by heat haze, the gigantic silos of Issoudun. We have been blogging for 6 years (this was our first ever post), and in that time we have had two redesigns. Mainly the redesigns have come about as people bought bigger and bigger monitors, and so were able to see a wider picture. For ages our format was very narrow because certain people (including those for whom we originally started the blog) were looking at it on an 800x600 monitor. 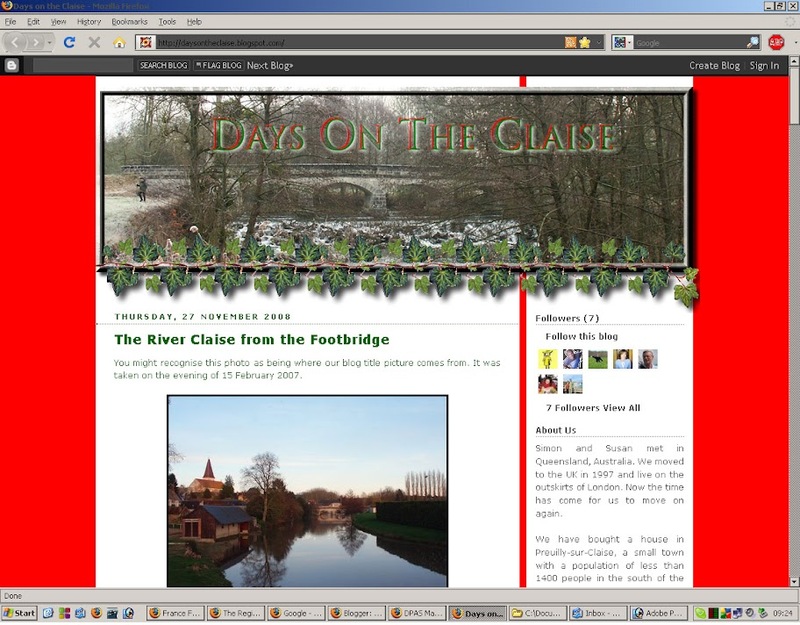 The layout was a modified version of Rounders 4, which stayed in one form or another until November 2008.
of visitors reached the same as our post code. This is how it more or less has stayed: we have rejigged the shape of the picture at the top (and changed the picture itself many times), but the colours and general layout have stayed the same. I hope the new layout is legible on whatever machine you are using to look at it, and that the bigger photos give you a better look into our lives. Don't forget you can always click on the photo to see it full size. 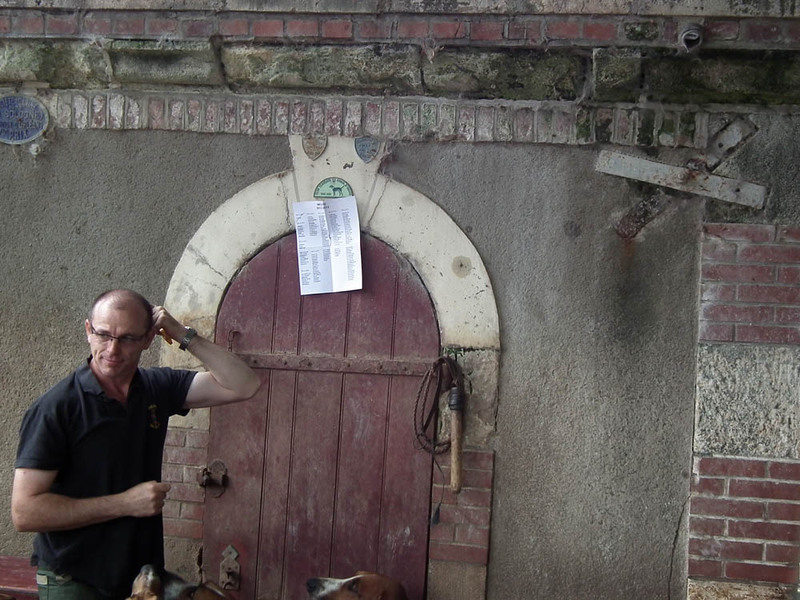 Drowning in the Loire: how to warn of the danger? This post is a straight translation of an article in the Nouvelle République of 16 August 2012. There has been an average of 3 drownings a day in France this summer - a figure that has shocked everyone. 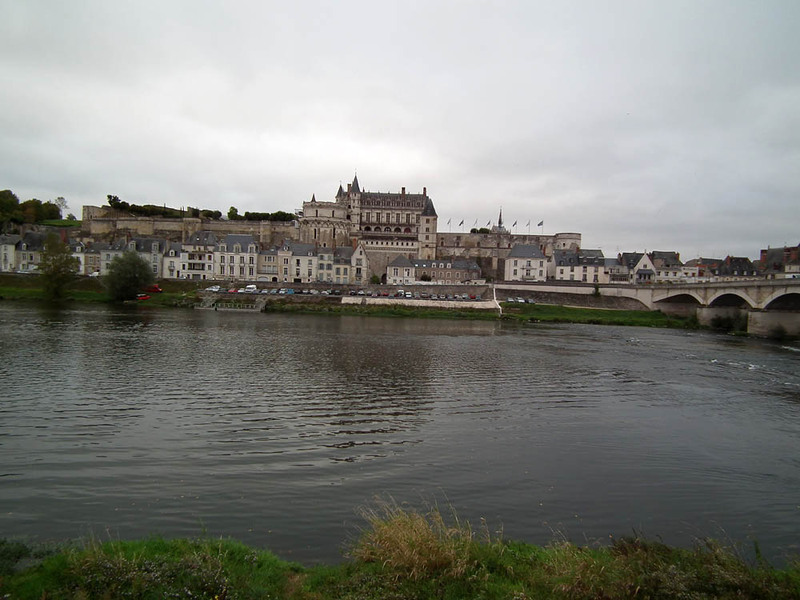 Note that swimming in the Loire at Amboise and a number of other places is banned. In the midst of the current heatwave, with temperatures up to 38C (100F) it is often all too tempting to go swimming in unsupervised or deceptively enticing rivers. After the drowning of a 10 year old boy on Monday in the Loire at Amboise it seems wise to recall the dangers of a river which is calm only on the surface. last October. We wrote about it here. The Loire is not a long tranquil river. Nevertheless, many tourists, not to mention local residents, do not hesitate to go swimming there. 'There's no county regulation to forbid bathing, but the town councils make the regulations,' explained an official at the prefecture (county hall). In fact, a county regulation was withdrawn in 2007, and from then on, the communes (town councils) such as Amboise, took on the swimming regulations. 'We are not hydro-engineers, but our team of officers knows the landscape and the dynamic of the river,' commented Thierry, from the Montlouis Loire Centre. 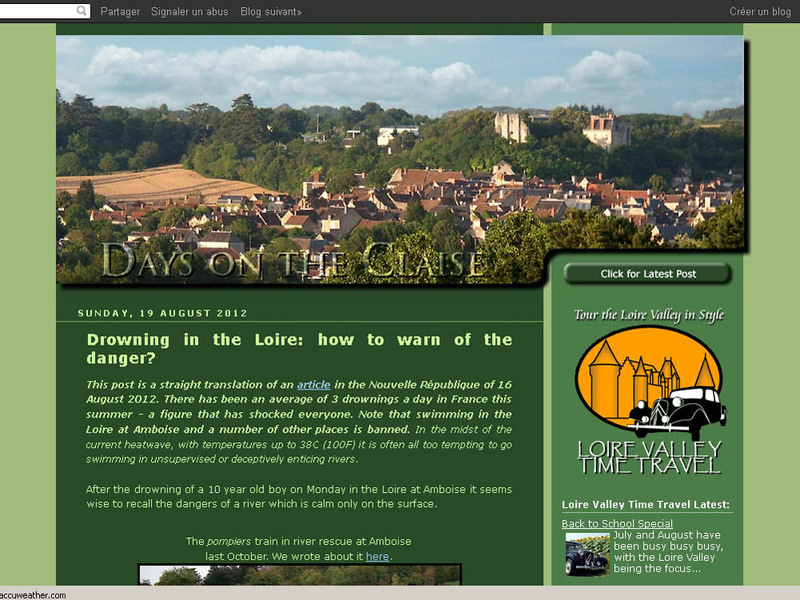 'The Loire is a living creature, dangerous, with two major elements to consider - water and sand. But the main problem is that the swimmers are not aware of the danger, rendering themselves vulnerable,' further explained the officer. Swimming in a river is not the same as swimming in a pool. 'The water is deep, you can have a thermic shock, you quickly lose reference points and landmarks, there is a strong current and when you are tired there is a tendancy to fight it rather than let it carry you along.' Panic and emotional shock only serve to accentuate the risks. The pompiers (fire brigade) are the lead emergency service here. 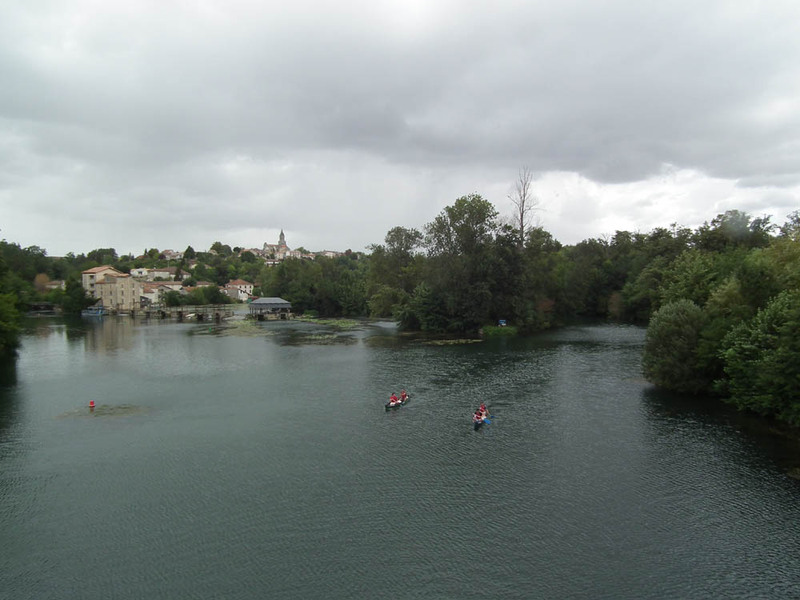 The Loire has great variation in terms of depth and water levels. Then there is the problem of quicksand, which forms according to the currents, uncompacted and with uneven, unstable edges. 'These are not shifting sands like you often hear of. In fact, you walk a bit through the water, it seems solid underfoot, and when you get to the uneven bit, the sand collapses and you are carried with it.' Thierry underlined the point, 'Familiarity breeds contempt. So many people say to us that they have swum in the river for decades and know the river well,' he said ruefully. In addition, the other big danger which catches out swimmers are whirlpools caused by the piles of the bridges or obstacles in the middle of the river. 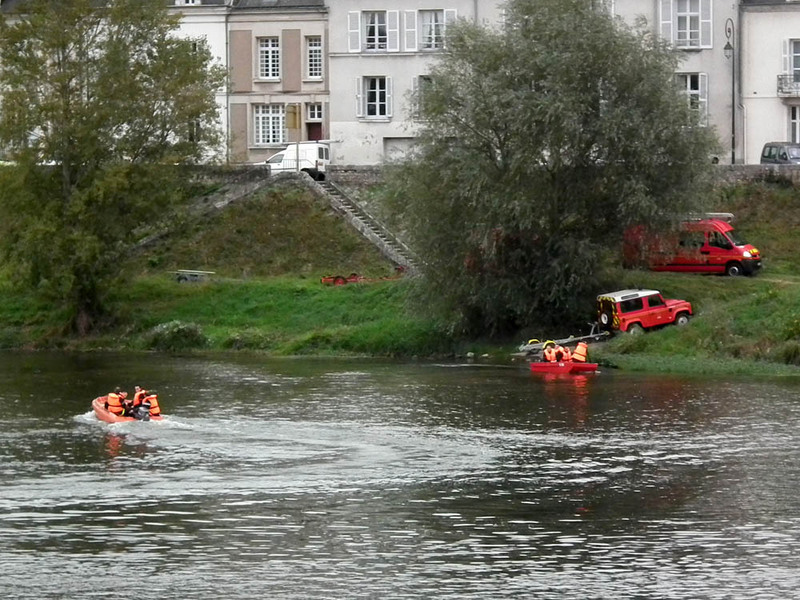 Shocked by the drama of Monday, the people of Amboise asked if the municipal police can't intervene when there are swimmers. 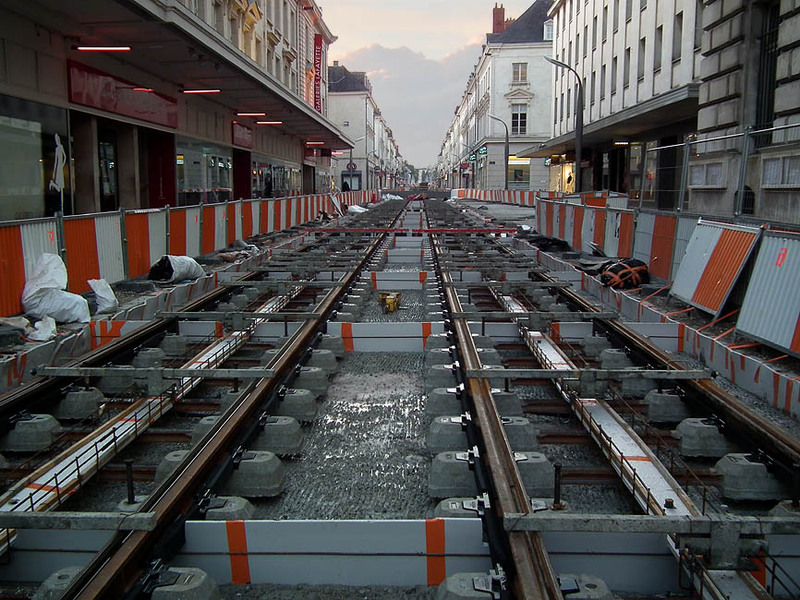 'Indeed, they can do so, and just last week were making people get out,' explained the mayor, Christian Guyon. Next to Nazelles-Négron there are campervans which come down right to the edge of the beach for the night and the occupants take advantage of being able to swim. 'We have to inform and educate the tourists,' explained a resident. 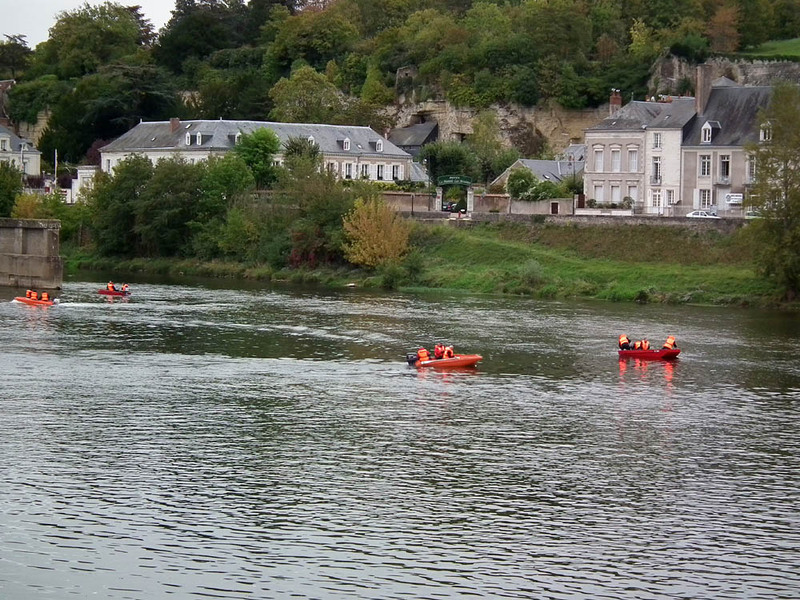 Monday, with the drama unfolding only a few hundred metres from them, there were still swimmers around Amboise. Upstream from the bridge you could also spot people up on boards, paddle in hand, without a life jacket. Original article in French by Pascal Laurent. I'd appreciate it if our bilingual readers with the time and inclination could check my translation please. The comment about the shifting sands didn't quite make sense to me for instance. Newspaper articles are always difficult to translate well as there always seems to be so much assumed knowledge and detail left out. The point of the article is clear though: the sand underfoot and the currents in the stream are treacherous in rivers. They are dangerous places to swim unless you are at a clearly designated swimming spot. If you are engaged in any sort of boating activity, for goodness sake wear a lifejacket. And never leave children unsupervised around water. Last Sunday the Days on the Claise Special Operations Bureau went to a village near Issoudun, in the Berry. In doing so we passed by some magnificent (if somewhat alien looking) radio transmitters. These are the shortwave high power aerials used by Radio France Internationale for their shortwave broadcasts. These are receivable in most parts of the world, so at various times of the day RFI broadcasts are made in English, Kiswahili, Hausa, Spanish, Portuguese, Romanian, Russian, Persian, Chinese, Vietnamese and Cambodian. The funding for this comes directly from the budget of the French Minister of Foreign Affairs. The antennae are known as ALLISS Antenna (from ALLouis + ISSoudun, the two sites in France they are located) and are very high power rotatable transmitters. 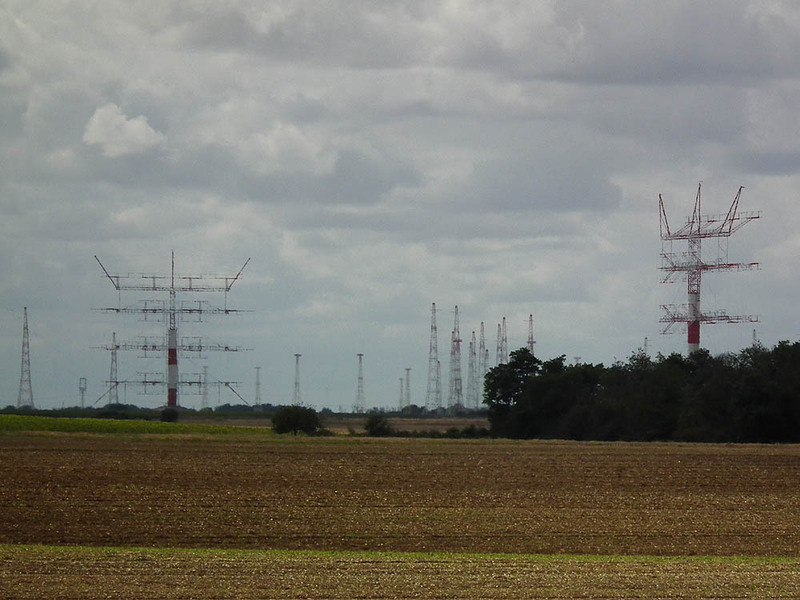 There are 12 on the Issoudun site, and they can broadcast to the whole world from this one site. They are what I guess you could call fully configurable - not only do they rotate, but they can also change a number of other parameters with a staff of just three people. This means that if they want to focus broadcasts on just one part of the world they can do so within 15 minutes. Naturally they are a very expensive unit (between US$10million and US$15 million a piece). Even their own publicity states "Any competent and reasonable transmission planning person should look at all other shortwave transmission options before considering ALLISS." in the foreground. In the background are the old style antennae. If you're learning French and want to listen to some simple, easy to understand stuff, you could do a lot worse than listening to "Journal en français facile" (last Friday's episode is here) from RFI. The Chapelle du Liget is situated just off the D760 in the heart of the Foret de Loches. It is such a picturesque little building that there is a walk dedicated to it called the Rando croquis (Sketch Walk). 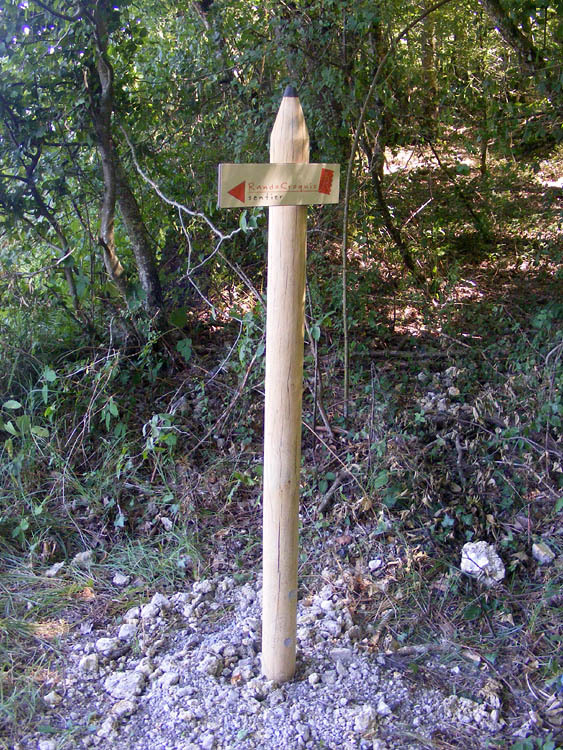 The waymarkers are cute pencil shaped poles. Technical tips to improve your watercolour. After a couple of hundred metres of walking in the forest there is a break in the vegetation and you look out directly at the chapel. It's a lovely scene. You are encouraged to take a seat and make a watercolour sketch. There is a big info board giving you the history of the place and another giving you hints and tips on how to create your watercolour. It's an almost irresistible idea, and I imagine that people really do go there to paint the chapel from just that spot. The chapel viewed from the forest. 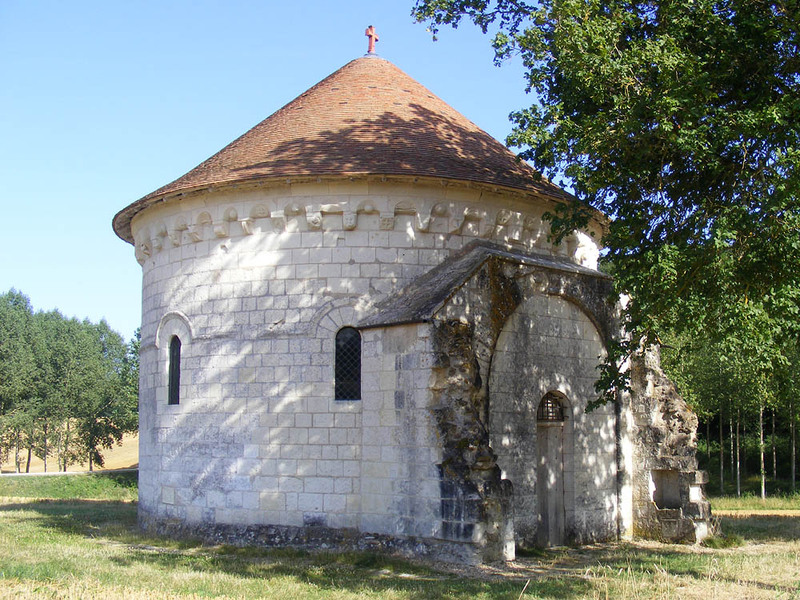 To learn more about the Chapelle du Liget, go to medieval historians Niall and Antoinette, who have written about it over on Chez Charnizay. We have written about the Tours tramway before (including mis-identifying the trams destined for Edinburgh as the trams for Tours). 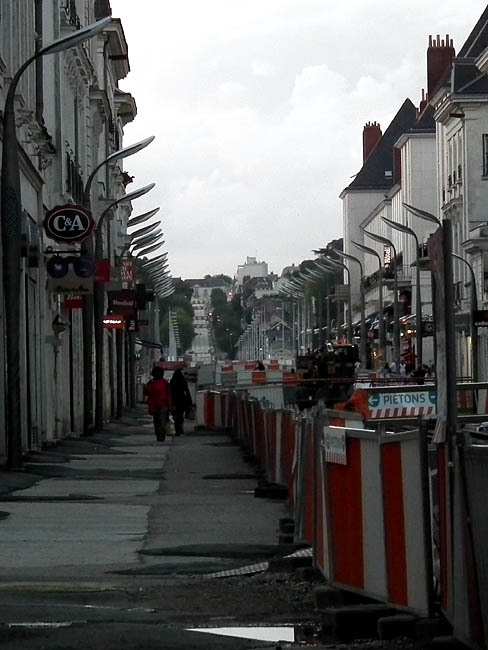 We have now seen the Tours trams on their way to be delivered (at Amboise on Monday 6 Aug 2012) but didn't get a photo of them. They look like this. 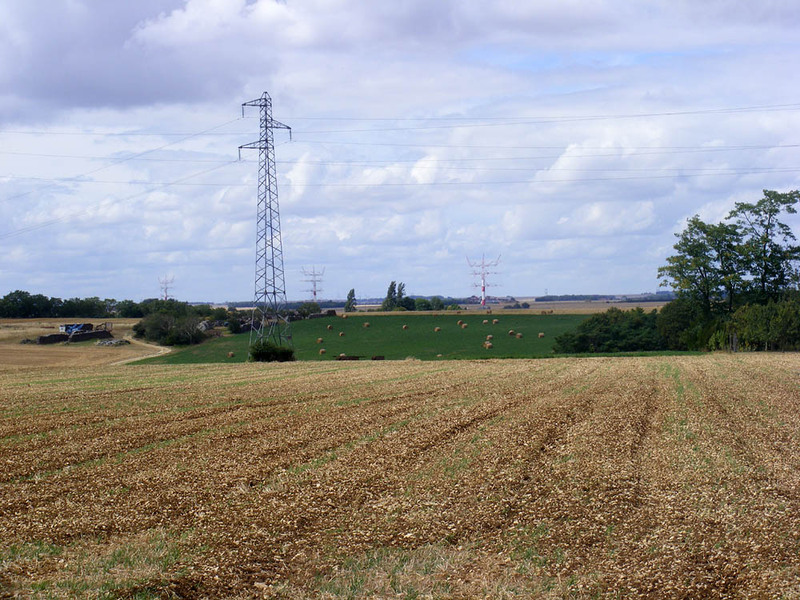 More interesting, perhaps, is the view in the distance of our second photo, as the tramway climbs the escarpement of the River Loire on the north side of Tours. Anyone care to recreate the chase scene from Bullitt? On the recent botany outing to the woods around the Chapelle du Liget I stumbled across (almost literally) what the expert mycologist in our group described as 'the best mushroom in the forest'. 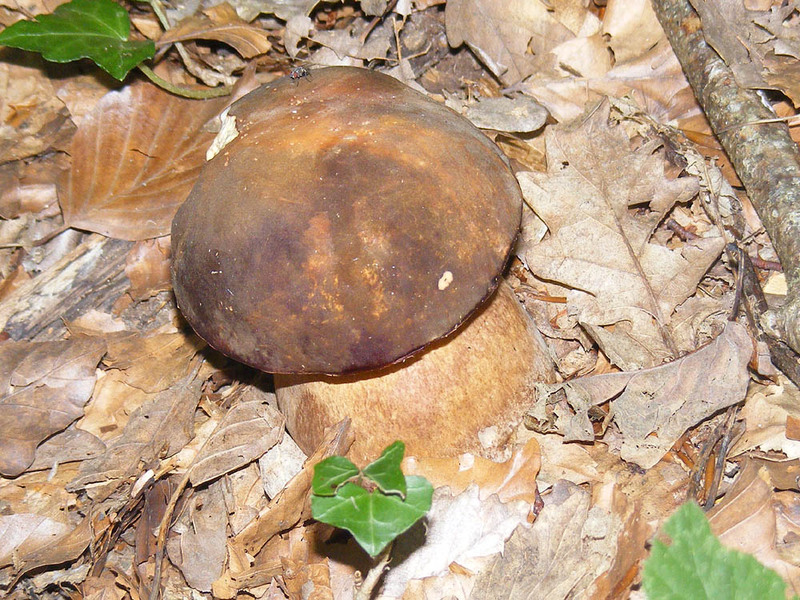 It's a type of cep (porcino) and apparently it trumps even the famous Cepe de Bordeaux Boletus edulis. Its name in French is the politically incorrect Tete de negre, now often amended to Cepe bronzé. Its scientific name is Boletus aereus. 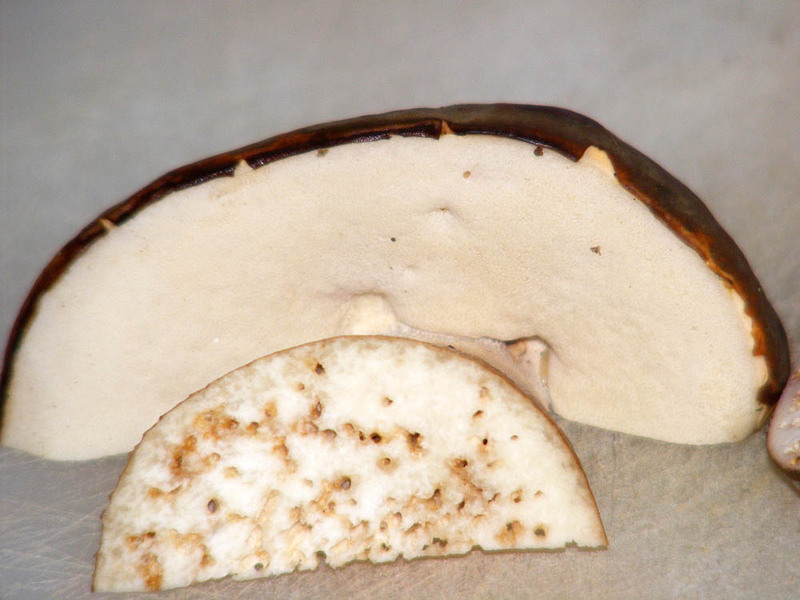 The mushroom is clearly recognisable as a bolete, with its squat fat tan netted stem and thick fleshy domed top. The skin is a dark olive brown colour, dry and without any hint of slime. Underneath the tubes (this is not a gilled mushroom) and flesh is creamy white, with very little rust coloured staining that I observed. The mushroom weighed more in the hand than I expected given its size. It has a pleasant mushroomy smell and a small piece tested on the tongue did not taste bitter. I found it growing in the leaf litter amongst oak and beech trees. Rogers Mushrooms lists it as rare. I was advised to brush it off, cut off the bottom half of the stem, which was clearly maggot infested, then slice the mushroom into thin slices and fry in butter. I duly did this for breakfast the next day and it was very nice. Not a religious experience, but certainly one worth repeating if I am lucky enough to find more and have an expert handy to identify it. To be honest, the mushroom looked exactly like all the photos on the internet I have found of it, so if I found another and it met all the criteria above I would be confident enough to eat it. ps. If you're in Preuilly sur Claise this evening, there is a concert at 5.00pm in the abbey church. We travel this road every time we visit the château at Cheverny (like today for instance), but I have never seen what streetview shows. Notwithstanding (and what a great word that is!) 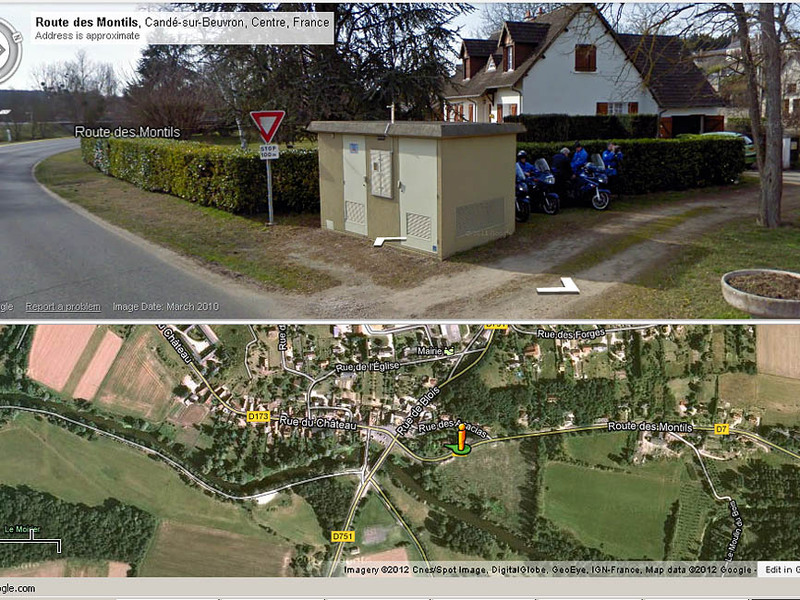 having seen streetview I am always extra careful - Candé-sur-Beuvron is one of those French towns where the 50km zone seems to stretch an unfeasibly long way out of town. 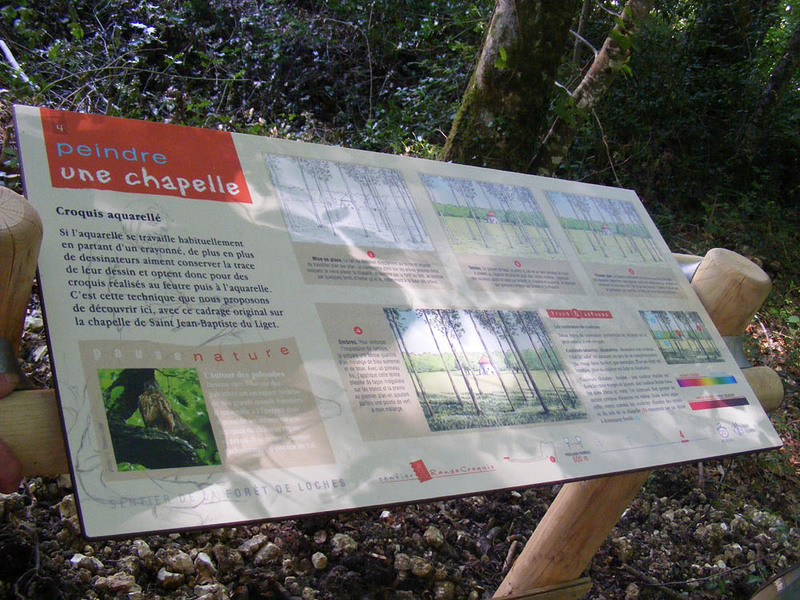 On 11 August the Association de botanique et mycologie de Ste-Maure-de-Touraine had an outing to the woods around the Chapelle du Liget to see a very rare orchid that grows there. The Violet Helleborine Epipactis purpurata is on the western edge of its range here and is a very rare orchid in France and the surrounding countries to the north and east. Pyramide de Chartreux and Hunters Lodge. 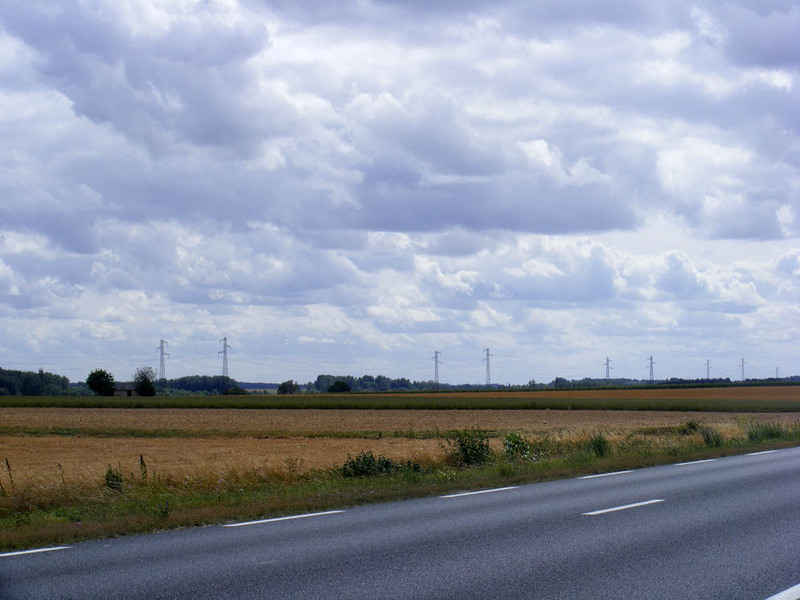 The meeting point was the Pyramide de Chartreux, on the D760 intersection with the route forestière Georges-d'Amboise. 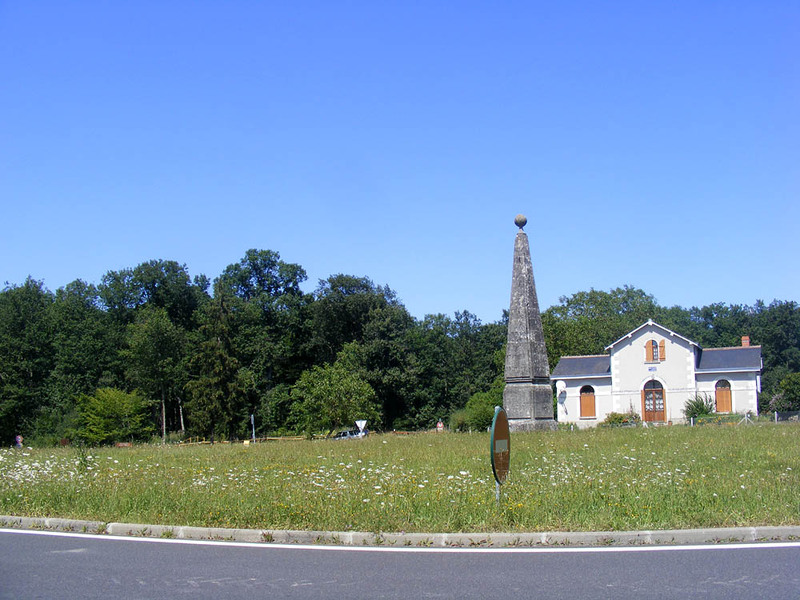 Four of these waymarking 'pyramids' in the Forest of Loches exist, at the major intersections of the old forest trails, now become roads. They help hunters and other forest users to orient themselves when deep within the forest. 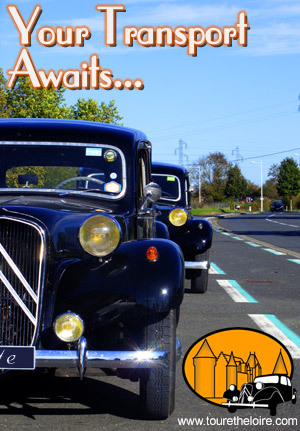 Each of the 'pyramids' is a slightly different design, so you can be in no doubt as to your whereabouts. (They are all known as pyramides but technically they are not pyramids because they sit on bases. Strictly speaking they are obelisks.) Niall and Antoinette have written about them more fully over on Chez Charnizay. The Pyramide de Chartreux sits in front of the old Hunters Lodge, now a private home. Once everyone had rolled up we drove down the road a kilometre or so to the Chapelle du Liget. 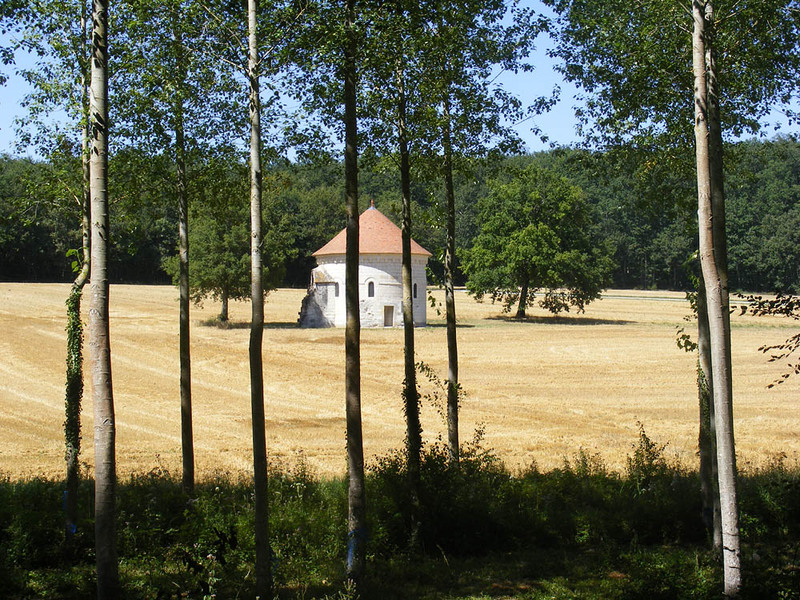 The Chapelle is a neat round little building in a large clearing that this year was used to grow a crop of wheat. Now harvested, the stubble gives a lovely golden glow to the chapel surrounds. It's all locked up and you can't get inside if you just turn up, but if you want to see the recently conserved wallpaintings that decorate the interior you can ask for the key at the Loches Tourist Office. Once again, Niall and Antoinette at Chez Charnizay have much more information, and have visited when it was open. Marc Fleury, our orchid expert, had brought along some Broad-leafed Helleborines Epipactis helleborine to demonstrate the typical Epipactis features that we were looking for. I think he has picked up how shocked I am that he takes samples like this, and was quick to point out that he only uses plants which do not have protected status. After this quick primer we walked along the designated path deep into the woods, then Marc dived off piste to the left. He pointed out a Bird's-nest Orchid, which he said the Violet Helleborine often grows with. 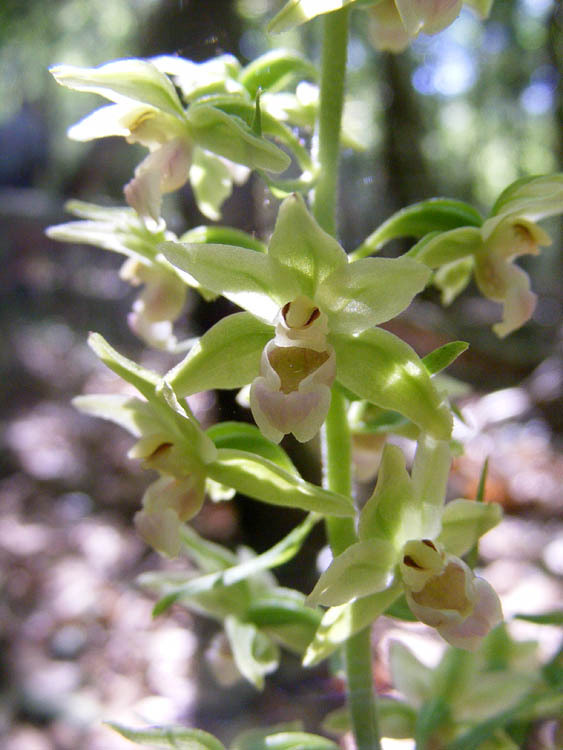 Here in the Touraine, the Violet Helleborine seems to favour pockets of somewhat calcareous soil, although in other places it is found in slightly acid locations. 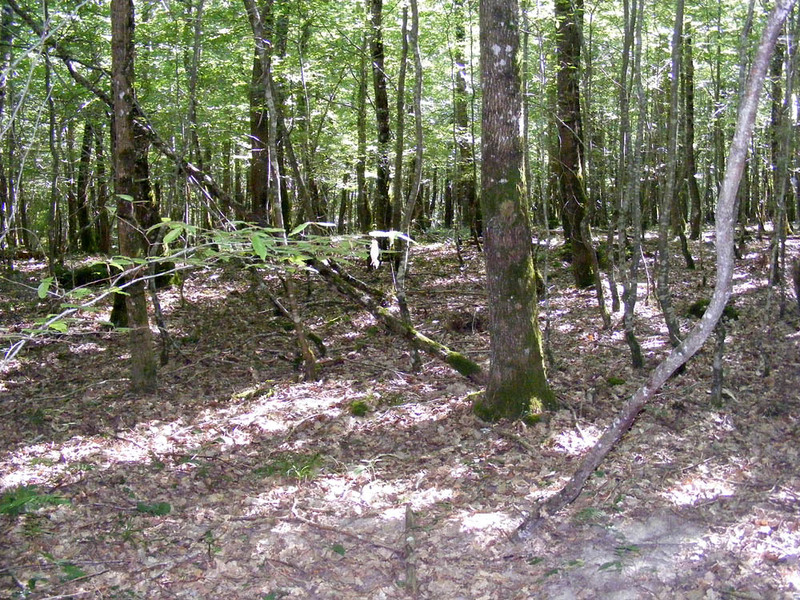 In the forest, mounds of raised earth can indicate more limestone in the soil, so we concentrated the search on these bumps. The orchid likes heavy, but not total shade, growing out of the cool soil under the leaf litter of mixed oak / beech forest, to a height of 30 - 70 cm with many large (for a European terrestrial orchid) flowers on a spike. The low light made them very difficult to photograph well when we did find a colony. The plants here are quite pale compared to many places, where they have a strong purple flush over the whole plant - flowers, stems and leaves. The woodland floor where the orchids grow. Along the way we also noted the fungi, finding a number ranging from a deadly species to the most prized edible species of all. Apparently the club is planning to return later in the year, to focus on fungi. Jeannine our secretary has been corresponding with the National Office for Forests, who manage the Forest of Loches, to advise them of our activities. In the past this has just been a courteous formality, but to her surprise this time the ONF (Office national des forets) has gone all officious on her and demanded a complete outline of our schedule for the second half of the year. My impression is that the main concern of the forestry officer in question is the hunt and the possibility of us disturbing game. Jeannine is not impressed. Midwife Toad, male and 3cm at most from nose to rump. On our way back through the forest we came across an old quarry, probably where the stone for the chapel was extracted. Horseriders obviously use the paths here and in a deep hoofprint in a muddy patch I noticed some movement. 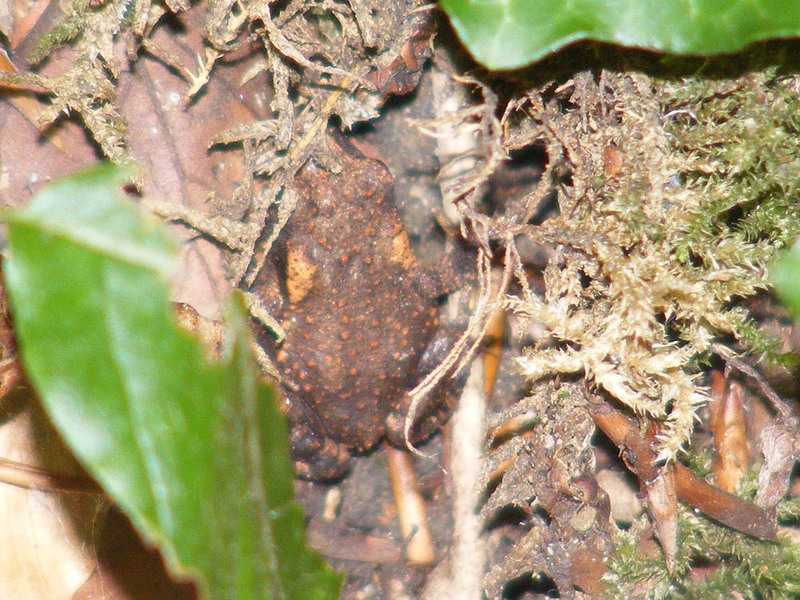 I managed to get a few poor photos of the tiny toad which was in the process of crossing the path, and only later realised that this was my first sighting of a Midwife Toad Alytes obstetricans! You can hear their delightful tinkling call almost any night from March to October if you stand outside our house, but I have never before seen this elusive amphibian (you can play a recording of their call on HerpFrance). Naturally, we rounded off the outing in traditional style, with drinks all round of Marc's homemade cider (we are on the 2011 vintage now apparently). He commented that he is starting to have trouble with the sanglier coming in to his orchard - presumably for the windfall apples. After relaxing and chatting for a while, we took ourselves home.